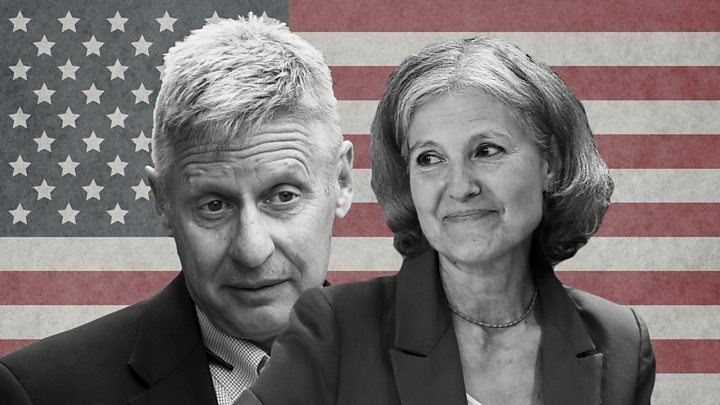 Libertarian Party candidate Gary Johnson and Green Party candidate Jill Stein have failed to qualify for this month's first US presidential debate. The Commission on Presidential Debates' announcement means only Hillary Clinton and Donald Trump will be on stage. Mr Johnson and Ms Stein did not poll high enough to qualify for the 26 September forum, says the commission. Each candidate was required to have an average of a 15% approval rating to participate in the three debates. The Libertarian and Green party candidates may be on the verge of their best showings in a presidential election, but their popularity still isn't good enough to get them on the debate stage. The chance to speak to tens of millions of Americans would have been a boon for either Gary Johnson or Jill Stein, but their absence doesn't foreclose their possible influence on this election. Given that Donald Trump and Hillary Clinton are currently neck-and-neck in the polls, if the third-party candidates even peel off a few more percentage points from one of the major party candidates or the other, it could swing the election. 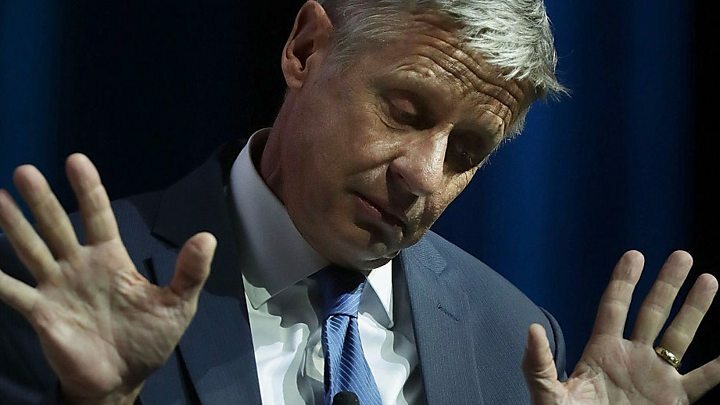 Surveys currently show Libertarian Johnson drawing about equally from both candidates. Ms Stein, on the other hand, almost entirely eats into the Mrs Clinton's support. It's enough to give some Democrats painful flashbacks to 2000, when Green Party candidate Ralph Nader won enough votes in Florida to tilt the state - and the election - from Democrat Al Gore to Republican George W Bush. The nonpartisan body reviewed five polls and took an average of each candidate's standing. The board determined average poll numbers to be Mrs Clinton on 43%, Mr Trump with 40.4%, Mr Johnson at 8.4%, and Ms Stein on 3.2%. The commission will review poll numbers again before issuing invitations to the next two debates. The Republican and Democratic vice presidential candidates - Mike Pence and Tim Kaine - also qualified to debate each other. Both the Clinton and Trump campaigns have previously pledged to participate in the debate series. Mr Johnson's most talked about moment in his campaign happened earlier this month when he was unable to identify Aleppo, Syria's largest city. Media captionGary Johnson and Jill Stein: Will third party candidates decide US election? "What is Aleppo?" was the New Mexico former governor's response to a question about how he would handle the refugee crisis. Ms Stein has drawn attention during her campaign for questioning the safety of vaccines. She was criminally charged earlier this month for vandalising construction equipment used to build a controversial oil pipeline.